The Socialist Discussion Club was alloted over $6,000 by UCCS’ Student Government Association (SGA) to fund a Nov. 30 screening of “Sorry to Bother You” and a question and answer session with director Boots Riley. The funds were approved 10-1 on Nov. 1 after SGA amended the request from $9,873.50 to $6,110.72. Arguments in favor of the bill during the meeting focused on the relative lack of politically focused events on campus. According to Gabriel Palcic, president of the Socialist Discussion Club, the event will include a screening of the movie “Sorry to Bother You,” and a question and answer session with Boots Riley where he will discuss his inspiration for the movie, his personal experience as a telemarketer and the communist influences for the movie. Palcic said that the club should be able to make up the rest through outside fundraising. “We have a few professors who have committed money to the event itself. We would go to other department heads, MOSAIC, the President’s Fund [for Student Diversity],” Palcic said. 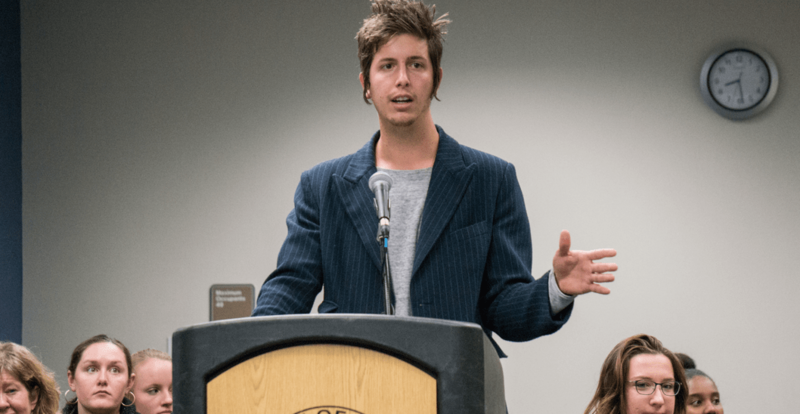 At the SGA senate meeting, Palcic reiterated to those present that it was still possible to be able to do the event with the money they were being given. The biggest expense involved in the overall cost of the event is the screening and speaking fee, which is around $7,000. According to Palcic, this amount is dictated by the booking agency. The one vote against the bill was Senator of Business Connor Price. Price said that he voted against the bill because he wanted money to go to more long-term products. Despite knowing that his fellow senators were likely to vote in favor of the bill, Price wanted his voting record to show a history of giving priority to bills with long-lasting effects. Price has voted on five bills this year at the time of print. He voted in favor funding for Pause for Paws, funding the Thomson Reuter’s Eikon Terminal — which he authored — and funding Women’s Club Soccer’s trip to a national tournament. Price has only voted against funding a ball machine for Club Tennis and funding the “Sorry to Bother You” screening. The director of “Sorry to Bother You,” Riley is a musician and social activist who has only recently started directing films, with the film being his first and only work. “Sorry to Bother You” is an absurdist, dark comedy that examines several issues, including issues of race and capitalism. According to the New York Times, he is a self-described communist since his teenage years and aims to use the movie to be able to spark conversation about the issues on display in the film. In the film, a telemarketer named Cassius Green (Lakeith Stanfield) works his way up the corporate ladder by utilizing a “white voice” to sell more products. He eventually goes from selling meager items to selling high-value weapons to governments and corporations. The film that was released this past July, also displays elements of magical realism. According to the Sundance Institute’s webpage, “Sorry to Bother You” won the Vanguard Award, an award created by the Sundance Institute to celebrate innovation and originality. It received a metascore of 81 by Metacritic and a 7.1 out of 10 rating on the International Movie Database. The event will take place on Nov. 30 from 6:30 p.m. to 8:30 p.m. in Berger Hall.